I should have also added it doesn't make you house stink for days... but I will leave that for you to find out on your own. Anyways... my friend Melissa said this about her tikka masala. "Every time I made it, I spent the following morning at work anxious and fidgety waiting for lunchtime to draw near so I could inhale the leftovers. So good. I could use all the adjectives in my arsenal, but instead, I'll simply suggest you try it for yourself. PLEASE." Truer words were never spoken because I feel the same way about this dish... and I will leave it at that. 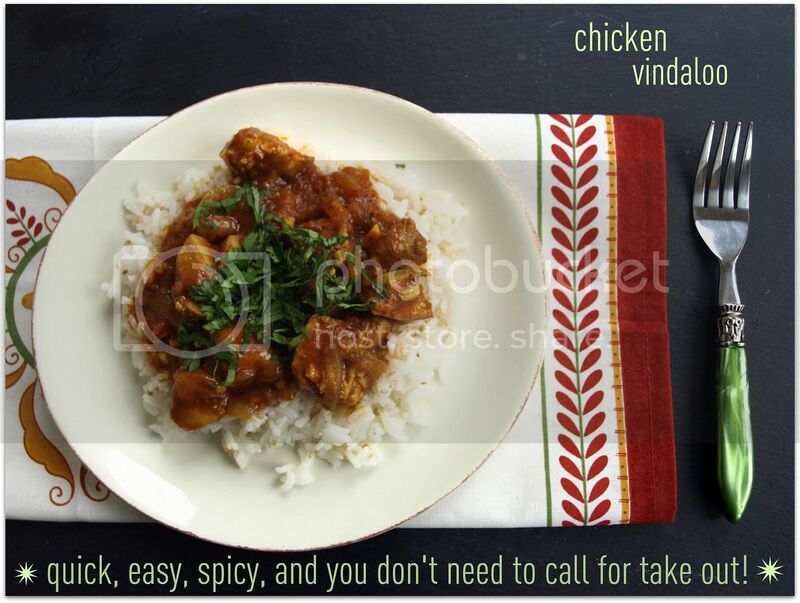 chicken vindaloo: adapted from fine cooking and chaos in the kitchen. remember you adjust the spices to your liking. I like spicy so spicy is what I made. If you don't care for spicy use mild curry powder and use more paprika instead of cayenne. I served this with jasmine rice spiked with sesame and mustard seeds. And you have to have naan to mop up the extra sauce! In a small bowl, stir the curry powder, cayenne, paprika, cumin, mustard, cardamom, and 3/4 teaspoon of black pepper. 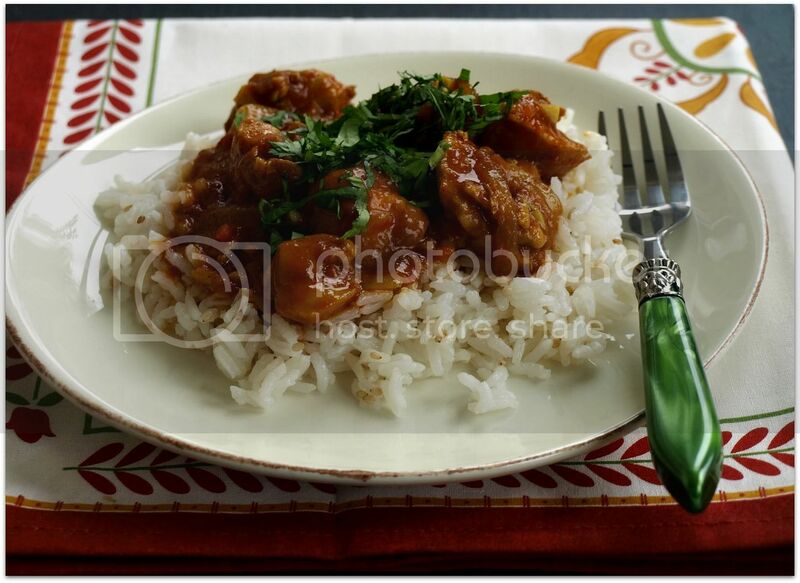 Put the chicken in a medium nonreactive bowl, sprinkle with a little more than 1 tablespoon of the curry powder mixture, about half of the garlic, 2 tablespoons of the vinegar, and 3/4 teaspoon salt; toss to coat. Set aside at room temperature. Heat the oil in a 10- to 11-inch straight-sided saute pan over high heat until shimmering. Add the onion and ¼ teaspoon of salt and cook, stirring occasionally with a wooden spoon, until it softens and begins to brown around the edges, 4 to 5 minutes. Reduce the heat to medium high, add the ginger, the remaining garlic, and the remaining curry powder mixture and cook, stirring, until fragrant and well combined, about 45 seconds. Add the tomatoes and mix to combine, scraping the bottom of the pan with the spoon. Stir in the chicken, the remaining 2 tablespoons vinegar, and 2/3 cup water. Bring to a boil, cover partially, reduce the heat to medium, and simmer, stirring occasionally, until the chicken is tender and cooked through, 15 to 20 minutes. Season to taste with salt and pepper. Serve sprinkled with the cilantro. And truly, you could not have given me a better testimonial. Obviously. I've had vindaloo waiting for a while. Now I will make. After carefully reading the recipe as you did it, I swear it's like you're channeling me on a weeknight. This meal is very us. Going to use this version for sure. yep, totally making this next week. I'll let you know how it comes out... Thanks ECM! Sounds wonderful....I'm mousing my way about the edges of Indian food, and this one sounds approachable. Will try it this week! I made this last night and it was excellent - just shy of restaurant quality, I think. Lovely recipe, i love chicken, i will try it today. This is a nice recipe you have here. I love chicken the most. And this is something really interesting. I love crazy-spicy food. How spicy is it? This recipe was crazy good. I will be making it again for sure.